We all know Jennifer Grey can dance - that is if we watched Dirty Dancing - so this is really no surprise. It is an electric performance I think... what do you think? 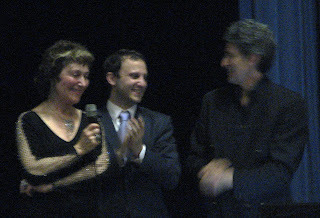 My happy snaps aren't the best but they will give those who didn't attend a small idea of the night of the Grand Milonga of the Sydney Salon Tango Festival held at Sydney Boy's High in the Great Hall. The night had a different feel to the night before. The hall was more crowded, the tables closer together and the dance floor even more of a log jam (sadly). The highlight of the evening for everyone was the performances - and the highlight of the performances was without a doubt, Gabriel Misse and Natalia Hills. Clearly classically trained Gabriel's footwork is intricate, precise and so fast that his legs move in a blur. It is as if he has more than one set of feet as his toes point in perfect position and his triple traspies (is there such a thing?) flash past - hence no photo of Gabriel it would just have been a blur!